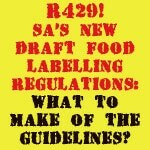 When R429, the new draft food advertising and labelling proposals descended on the SA food-bev industries on May 29, the Guidelines extensively referred to in the text were noticeable by their absence. This uncertainty was relieved a week later with a further 145 pages to digest…. comments and insights from a foremost SA food labelling expert, Nigel Sunley, and regular contributor to FOODStuff SA. First off, one hopes the deadline for comment will be extended by at least a week to compensate for their delayed arrival! There are no less than 17 Guidelines, ranging from the very simple (Guideline 4 with its examples of negative claims) to the highly complex (the 48-page Guideline 16 which sets out procedures for preparing a health claims submission dossier), and from the constructive and helpful (Guideline 5 which assists with QUID declarations) to the mildly controversial (Guideline 11 with its serving sizes) to the frankly unnecessary (the ‘Background’ section of Guideline 14 on marketing to children which is nothing more than a bigoted and inappropriate tirade against the food industry which should have no place in any piece of legislation!). A question raised on numerous occasions in relation to the old 2012 legislation, R146’s Guidelines, and will undoubtedly now be raised again is: what is the legal status of the Guidelines? I am frankly not qualified to answer this question but I have heard several suggestions from legal practitioners that their formal status as enforceable pieces of legislation is at best questionable (unlike the mainstream regulations themselves). Certainly there are a large number of components of the Guidelines that would far more appropriately be accommodated as formal regulations in their own right rather than as technical backup, and the definitions of ‘guidelines’ in both R146 and R429 appear to give the Director General of Health carte blanche to amend them at any time. This in itself raises significant legal issues and it would certainly be interesting if the whole concept of the Guidelines were to be formally challenged in court. Summarising the Guidelines is a fairly daunting task but some of them stand out as warranting particular attention. The existing R146 Guidelines on product information, dietary carbohydrates, QUID, allergen control and sampling procedures have been tidied up and supplemented with a few minor and largely uncontroversial changes, so no issues there. The Guideline on misleading claims is still a copycat version of its UK counterpart but has been tidied up and a number of irrelevant references to EU requirements removed, and this is to be commended. The first major one is Guideline 11 for recommended single serving sizes, which attempts to overcome the universal derision heaped on the original proposals prepared in this area back in 2007, which were based on Canadian values and featured maple syrup but no sign of maize meal! The latest effort is much better researched and far more South Africa-friendly but inherently remains somewhat arbitrary in nature and the onus on food companies is to scrutinise the proposed values and challenge them if and where appropriate. The real hot potato is of course the Guideline 14 on ‘Commercial Marketing of Foods to Children’. No prizes for guessing how this was compiled, as it is riddled with the simplistic rhetoric beloved of pie-in-the-sky, left-wing public health practitioners that heaps blame on the food industry for the obesity problem and conveniently sidesteps issues such as nutrition education, lack of exercise and personal responsibility. One really despairs at the attitude of lawmakers who have probably never set foot in a food factory or, more importantly, a focus group that might actually tell them a bit about consumer behaviour, but who somehow persist in the spectacularly naïve belief that you can legislate eating habits. Be that as it may, it is interesting to compare the content of Guideline 14 with the Advertising Standards Authority Code of Practice for Advertising to Children which is a far more pragmatic and sensible approach to the obesity problem – which the food industry fully acknowledges but for which I feel it is getting fed up with being targeted as the sole scapegoat by ideologically-driven nutritionists and legislators who have done a lousy job of educating the consumer and are looking for someone else to blame. There is no doubt that Guideline 14 goes far beyond the ASA Code and contains a number of provisions which are of highly questionable legality, devoid of credible scientific evidence to justify their introduction and, most importantly, completely unenforceable. I am not aware of a single, high-profile prosecution of a food company under R146 – so what chance is there of anything relating to R429 doing any better? The total impracticality of some of the proposals alsoboggles the imagination – are you going to shut down social media access to all school-going children to prevent their minds from being polluted by fast food adverts? Are you going to tell a large, spotty 18-year-old lock forward in Grade 12 that he can only consume milk, fruit juice and water? Guideline 14 needs a major revamp if it is to have even a remote chance of producing any significant benefits – the sad thing is that the principles behind it are worthy and commendable ones, but their conversion into would-be legislation has been handled in a completely impractical and ideologically-driven manner that in its current form is, at best, completely unrealistic and, at worst, probably open to formal legal challenges were it to become law. It is, however, a time for cool heads and the food industry needs to look long and hard at whether any extension to the ASA Code is warranted and be prepared to co-operate within reason, while pushing back firmly against any of the more loony proposals that will force it to commit commercial hara-kiri while not resulting in any significant public health benefit – there are alas a lot of these in Guideline 14. The other and perhaps most puzzling Guidelines are those relating to assessment of claims. The DoH appears to have an obsession with weight management claims as there is a dedicated guidance document under Guideline 15 dealing with claims of this sort which appears to be pretty thorough and refers in several places to EFSA documentation, which can realistically be expected to constitute a suitable benchmark. However, we also see a large and elaborate Guideline 16 dealing with dossier preparation for health claims in general to which no reference of any sort is made in R429 itself? Does this mean that the DoH will not consider any potential new health claims other than those relating to weight management? What about claims that have been approved by EFSA and other reputable global regulatory bodies or which may be approved by them in the future, but which do not fall under the provisions of R429? What about local companies that want to submit non-weight management related claims for consideration – the information for preparing dossiers is supplied in Guideline 16 but there does not appear to be any process for using it unless you are submitting a weight management claim! It is all very bizarre and companies with an interest in submitting health claims need to shout loudly for clarification during the comment period. So we have the same mixture of good bad and ugly that we saw in R429 itself. Clearly a lot of thought has gone into the Guidelines and the DoH is to be commended for this. The technical complexity of many of them is very considerable and anyone wishing to submit comments needs to do some significant scientific and legal homework and do it fast, as time is short. Guideline 14 should however be of major concern to all food companies and needs a measured response with a strong element of the iron fist in the velvet glove if food companies’ right to conduct business in a fair and ethical manner is not going to be sacrificed on the altar of impractical and unenforceable nanny-state interventionism. Watch this space! Sunley Consulting / Consultants in Food Labelling (CFL) [Contact CFL for expert consulting and tailored workshops on all labelling and other regulatory issues].